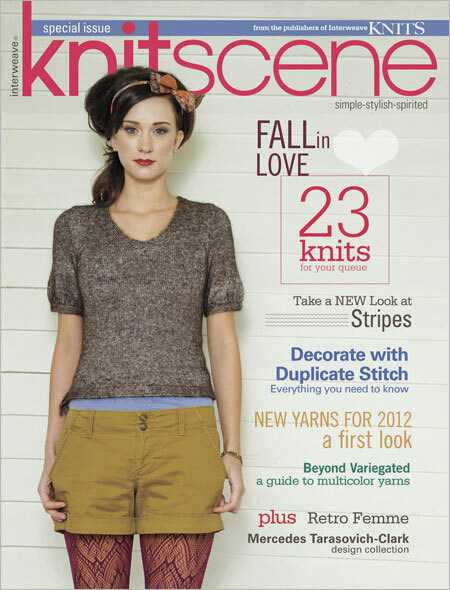 I’m super-excited to see that the new Knitscene magazine is on newstands now! Over the summer Lisa Shroyer, Knitscene’s editor, asked me if I would be interested in being a featured designer, which meant being interviewed (and photographed, eek! ), as well as designing a mini-collection. Of course I said yes! 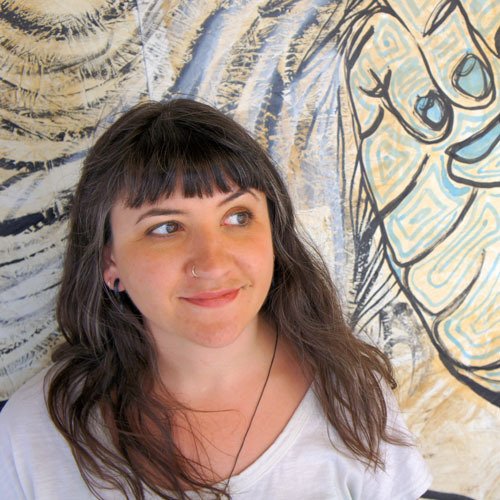 I had the fun task of recruiting a local interviewer and photographer, so I shared the Knitscene love with my friends, Clair McLafferty and Cary Norton. I’m not really comfy in front of the camera, but Cary put me at ease talking about geeky iPhone love and beekeeping, and I loved the resulting pics. Clair’s expertise at interviewing folks for Birmingham Magazine showed, and I had fun telling her all about my knitting life (Clair’s also my gorgeous model for self-published patterns like Haven and Ayano). I designed a trio of retro-inspired pieces: an embroidered slim cropped cardigan, a wide-necked pullover with striped trim, and a flowing floral-embellished camisole. My favorite piece is the Seberg Sweater, I can’t wait until I have some time to spare to make one for myself. I was inspired by watching the adorable actress Jean Seberg in the 1960s French film “Breathless“. 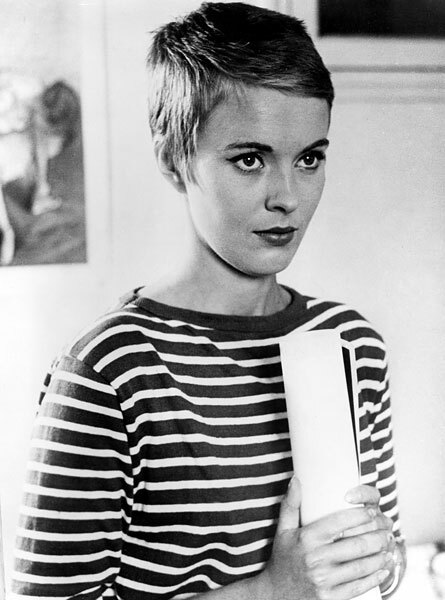 Seberg wore some gorgeous, iconic striped fashion in that film. Watching it, I knew I wanted to make at least one collection piece with form-fitting retro style and those graphic stripes. I picked a basic raglan pullover shape as a starting point, and then made the neckline lower and wider to become the focal point. The sweater begins with a wide bias-knit striped garter band, and then the rest of the sweater is picked up* and knit down in one piece. I incorporated shaping into the front and back of the piece in sleek lines, and finished the sleeves and body with neat, turned-under stitched hems (one of my favorite finishes!). The resulting sweater is a surprisingly fast, simple knit, and a timeless wardrobe piece. The model garment is knit in classic Brown Sheep Company Cotton Fleece, a crisp, longwearing cotton and wool blend. Thinking of knitting a Seberg? 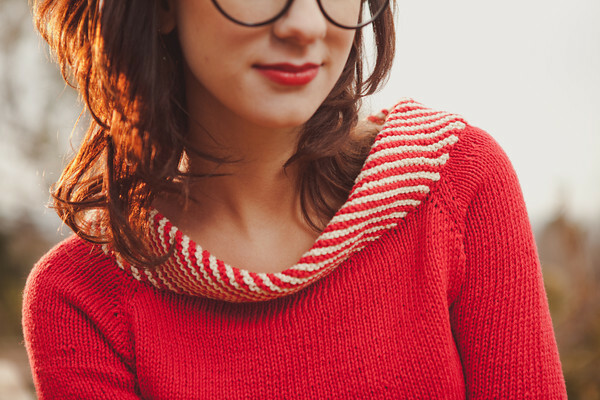 The sweater is meant to fit with little to no ease, so pick a finished bust measurement that is as small as 1-2″ less than, or up to 2″ more than, your actual bust measurement, depending on how snug you prefer the fit. Length is easily altered, just adjust to your style and body shape. You could even make a cap sleeve or long sleeve version! This is why top-down raglans are so blindingly popular, you can’t beat the options to customize on the fly. I’ll be profiling the other Knitscene garments, the Beulah Cardi and the Fleurette Camisole, next week, so stay tuned! *Picking up a bunch of stitches like that can sound like a drag, I know. On Stockinette stitch edges, I would agree, but picking up on garter stitch edges can be a breeze. I’ll be posting a short tutorial next week with the method I use. Love love love it! Your designs are so amazing! Keep up the good work! Thank you! I’m working on new designs now. The model is wearing a size small/31.5″. Thanks! I’m really happy with this issue. We should grab coffee the next time you’re in B’ham!